If you don’t love your smile or how your teeth look, you don’t have to live with this embarrassment. Cosmetic dentistry from Philadelphia Dentistry is the answer to every aesthetic dental problem. Discolored teeth? Crooked teeth? Chipped and broken teeth? Whatever your complaint, with cosmetic dentistry and the help of Dr. Ken Cirka and his associates, you will never have to feel self-conscious about your smile again. ZOOM! Tooth Whitening: ZOOM! tooth whitening remains one of the most popular cosmetic dentistry treatments and for good reasons. The treatment is brief, results are immediate, and whiter teeth transform your appearance dramatically. ZOOM! 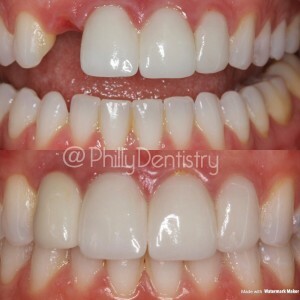 whitening can be completed in the Philadelphia Dentistry office in just about an hour, makes teeth 10 shades whiter, and can last up to three years. The whitening is customized for even results, so you don’t have spotty results as you would with an over-the-counter method. Tooth Whitening: Center City dental patients who are interested in tooth whitening on their own time love tray bleaching. This option is convenient and allows you to be in control of your own tooth whitening, plus it’s great for patients with tooth sensitivity. You take home customized whitening trays and bleaching gel to use for 10 minutes a day over seven to 10 days. This method produces teeth that are, on average, six shades whiter and results last for up to two years. Porcelain Veneers: If you have multiple complaints about the appearance of your teeth, porcelain veneers may just be able to correct them all. Chips, stains, discoloration, gaps, short teeth, misalignment, oddly shaped teeth – these problems can all be corrected at one time with veneers. The super-thin pieces of porcelain are custom-made to blend with the color of your existing teeth and bonded in place to create a white, natural-looking new smile. Veneers are stain resistant and, with proper brushing, flossing, and visits to your Philadelphia dentist, can last for decades. Cerinate Lumineers: For patients who are squeamish about porcelain veneers, Cerinate Lumineers offer the same amazing benefits in a non-invasive procedure. Instead of removing tooth enamel to put the veneers in place, Lumineers require only minimal prep – namely, a cleaning and light sanding. The veneers are incredibly thin and durable, they are customized to fit perfectly on each treated tooth, and they look completely natural. Invisalign: For any adult who has ever wanted straight teeth, Invisalign is a dream come true. Discreet, efficient, and affordable, Invisalign braces are designed just for your unique misalignment problems. You can go about your daily life and fulfill obligations wearing nearly invisible aligners and no one will ever notice them. Plus, you still have the freedom to eat whatever you want, whenever you want. Dr. Ken Cirka is an Elite Provider of Invisalign, which means he is a top-rated and highly experienced Invisalign provider in Philadelphia with hundreds of success stories to his name. To truly transform your smile and get the teeth that are not only perfect but perfect for you, it’s important to identify every concern you have about your teeth. Some patients must undergo restorative dentistry before moving on to cosmetic treatments – for any smile to be just right, the foundation must be healthy first. If you want a perfect smile that is dazzlingly white, completely aligned, fully functional, and healthy, contact Philadelphia Dentistry to schedule your consultation about cosmetic dentistry. There is a procedure for everyone, no matter your concerns, and you can have that gorgeous, five-star smile you’ve always envied on other Center City residents.